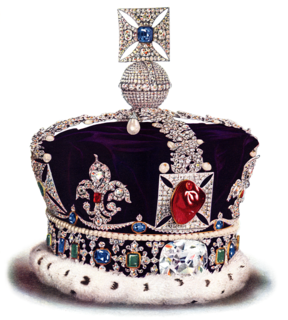 The Crown of William II, also known as the Hohenzollern Crown, is the 1888 crown made for William II, German Emperor, in his role as King of Prussia. It was only used for heraldic purposes. A Crown of the German Empire was never made. The crown is surmounted by a diamond-studded cross which rests on a large sapphire. These rest on eight half-arches rising from the base that are adorned with 142 rose-cut diamonds and 18 diamonds. Eight large pearls are mounted between the arches. When William abdicated in 1918 he was permitted to retain the jewels, which included the Hohenzollern crown. To protect it from theft and destruction during World War II, it was hidden in a wall in the crypt of a church. After the war it was returned to the Hohenzollern family and is now kept at the family residence of the Hohenzollern Castle. ^ "Regaling about Regalia". European Royal History. 25 July 2012. Retrieved 2016-02-05. The Crown Jewels of Württemberg are a historical jewel collection belonging to the Kings and Queens of Württemberg. Crown of Baden, also known as the Grand Ducal Crown of Baden is a crown formerly used by the Grand Duke of Baden and part of the Crown Jewels of Baden. 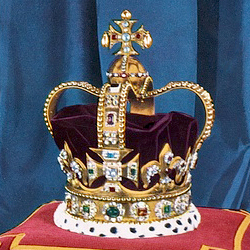 The crown is 26 cm high and has a diameter of 13,8 cm. Today the crown is kept at the Museum of Baden, which itself was built within the old walls of the former Karlsruhe Palace.